Sunday February 9th 1896 The roads were so rough that we did not go away from the place. I read a great part of the day. I had some head-ache and did not feel very well. Monday February 10th 1896 It snowed nearly all day. I finished Wills mittens and got the rags down for another mat and began that. Seth went down town in the afternoon. Tuesday February 11th 1896 I was busy all forenoon with the work. Will went downtown. We had early dinner and went down to the valley. Called at Aunt Melindas, Ella Bird, and Stevens. Seth took wood to town in the afternoon. I worked on my mat in the evening. 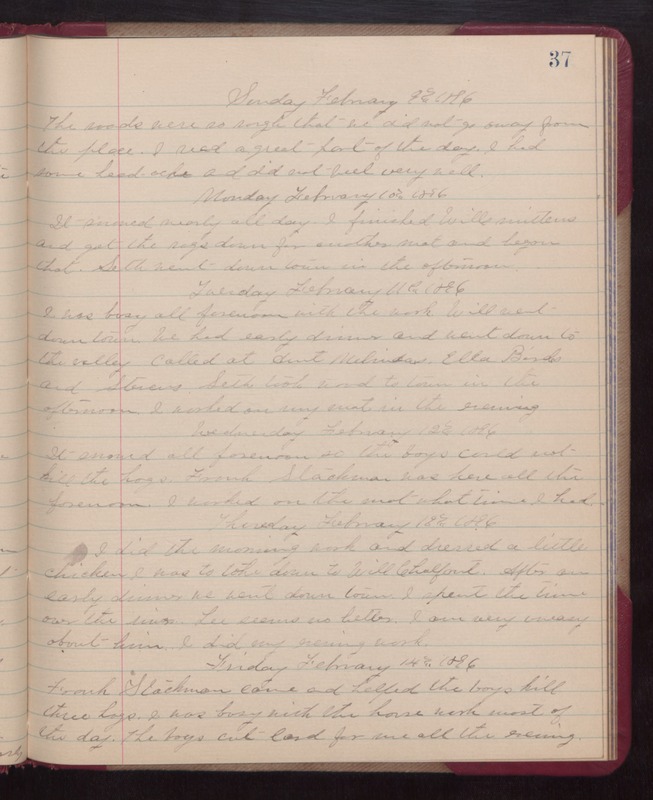 Wednesday February 12th 1896 It snowed all forenoon so the boys could not kill the hogs. Frank Slackman was here all the forenoon. I worked on the mat what time I had. Thursday February 13th 1896 I did the morning work and dressed a little chicken I was to take down to Will Chalfant. After an early dinner we went down town. I spent the time over the river. Lee seems no better. I am very uneasy about him. I did no evening work. Friday February 14th 1896 Frank Slackman came and helped the boys kill three hogs. I was busy with the house work most of the day. The boys cut lard for me all the evening.